Faux Leather Effect still looks good. 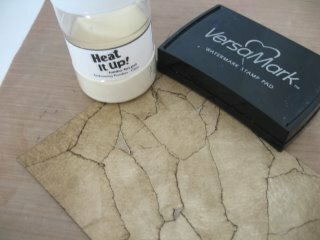 Another technique for you to try...this time for a Faux Leather Effect. There are such a lot of different cardmaking techniques and it is time consuming trying to keep up to date with them all. But here is another that is easy to create, and you will find many more that you can watch in Tutorials. 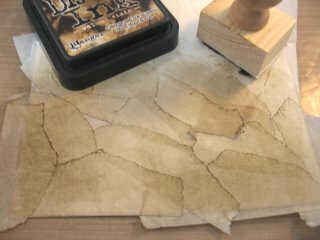 The effect we are trying to get here is that of antique patchwork leather, and it adds an unusual look to your cards. Find that old roll of masking tape and we will give it a try. 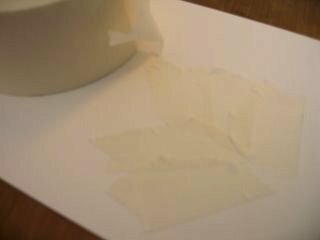 Add torn off strips of masking tape in a random way all over the cardstock, until it is completely covered. Don't worry about it being neat, but try to make sure that all the edges are stuck down properly. 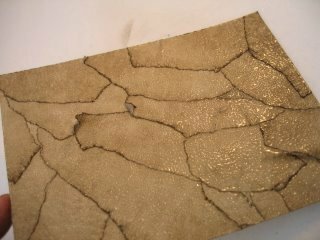 Once you have done that take a piece of sponge, cut and dry or a blending tool and with some distressing ink go over the masking tape in circular motions until it is all blended in. The next step is to cover it all with VersaMark and the sprinkle some clear embossing powder all over. Shake the surplus back onto some creased paper and pour it back into the container for the next time. Once the powder is heated it will melt and go shiny. Leave it to cool, and don't worry if it curls. You can glue it to some stronger backing card and it will lie flat. Try using different colours of inks, or blend two of them together to match your scheme. The flower on this card is made from the Paper Roses Tutorial. 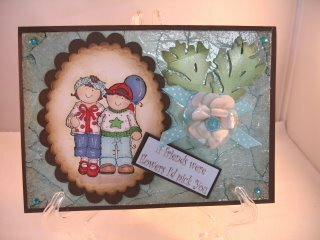 The Faux Leather Effect is really nice and can go along way on your cards.